Most homeowners tend to ignore their gutters until they really start giving them problems. Generally speaking, you only notice that your gutters need cleaning when symptoms of damage like leaking have already begun to set in. That’s why regularly scheduled cleaning are important. When building up your chore list, it may be really easy to overlook gutter cleaning since they are hanging above your head, out of sight, and out of mind. But don’t make the same mistakes other homeowners do. Neglecting your gutters can lead to unnecessary and costly repairs. Giving it enough attention and maintenance can save you money in the long run and most importantly, increase your home’s lifespan. Flooding can cause significant damage to your pricey landscape work. Though you can’t do anything in cases of extreme and hostile weather conditions, keeping your gutter in full functioning condition can keep your property safe from standard rain storm flooding by enabling proper drainage. If your gutters are functioning well, it will direct the drainage stream wherever it needs to so that it won’t ruin your lawn, wash away your hedges, or erode an expensive lawn statue. Bugs, pests and all other kinds of insects like to stay on clogged gutters. No one likes mosquitoes, right? Here in the Birmingham area, we have just the right summertime environment for those pests. Just add water, and they appear out of nowhere. Clogged and dirty gutters may be placing your family’s health and safety at risk as mosquitoes and spiders will definitely take up residence in your neglected gutter. Keeping your gutters clean can significantly reduce the chance of these little critters pestering you and your family. An unobstructed and free-flowing gutter can wash away any pests that are trying to settle in. Queue the itsy bitsy spider song up in your playlist, cause with a clean gutter they’re gone. A poorly maintained gutter wouldn’t be able to properly lead water to where it should be which can cause splashing or even flooding. And as you probably already know, standing water can wreak havoc on all of your exposed wood surfaces. One of the prime-selling points in the realty market are decks. So it is important to keep them in as good shape as you possibly can. Wooden decks, doors, and fascia add aesthetic beauty to your home and should be preserved. Properly functioning gutters divert roof runoff from those surfaces and helps to limit water damage to your homes exterior surfaces. If you had been unlucky enough to live in a house with a cracked foundation, you certainly wouldn’t want to deal with that all over it again! Cracked foundations are common during colder months when standing water around your house causes frost-heaves these can threaten the structural integrity of your house as a whole. As soon as you notice clogged gutters freezing up during winter months, take action and handle it accordingly. Worried about your gutters’ condition? Reach out to a professional like Get Superior Cleaning and let them take care of if it for you. We offer convenient gutter cleaning schedules to give you more peace of mind. 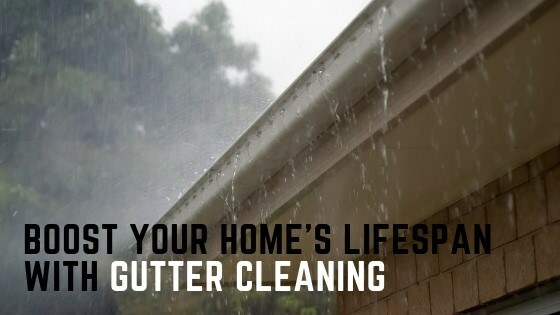 Gutter cleaning is a reasonable investment that can very well save you tens of thousands in repairs or replacements.